2 columns. Written Area: 42 x 180mm including gutter. Column Width: left 74mm, right 77mm. Number of Lines: 10. Line Height: 4.2mm. Rubrication. Some bookworm damage. Gothica Textualis. Content: Breviary. The recto (column 2) has the heading for 3rd Nocturn while the verso has the heading for 2nd Vespers (column 1). Have Colker's notes. 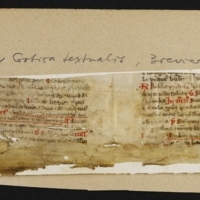 Physical Size: Bottom fragment of 1 piece of parchment (224 x 56mm) glued to a piece of white paper (225 x 58mm), which is glued to a piece of brown paper (282 x 100mm).